Students will learn Krav Maga’s fighting stance & movement, punches/kicks from standing position & from the ground, elbows/knees, and how to defend against punches/ chokes/headlocks/wrist grabs. Students will learn additional punches and kicks, punch defenses with counterattacks, kick defenses, defenses against various chokes, headlocks, and bear hugs. In this intermediate class students will continue to train on more advanced strikes, defenses against strikes, fall and rolls, self defense, and additional ground fighting techniques. 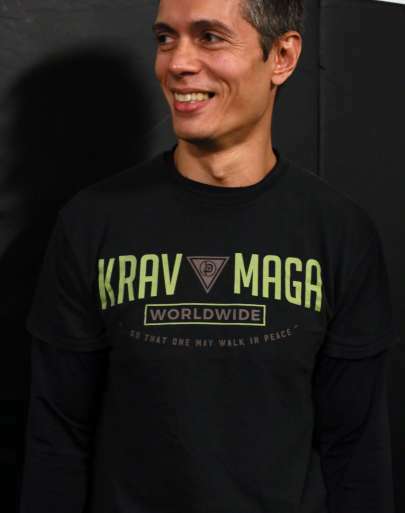 The curriculum includes additional punches and kicks, more defenses against punches and kicks, defenses against sticks, knives and handguns, as well as advanced ground fighting techniques. This class is for advanced students only and covers all the advanced curriculum including fighting, ground fighting, advanced self defense, all weapons defenses, and third party protection. Last year at 55, I decided it was time to learn how to defend myself. I have some physical limitations due to a car accident 20 plus years ago so I wasn’t sure what type of program would work for me. I also wanted fitness to be a part of the program. 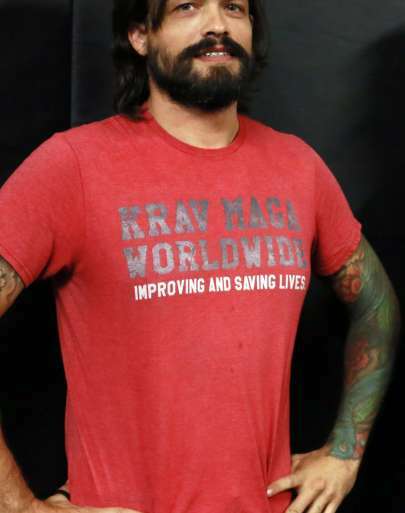 I found Krav Maga Worldwide in Pompano online. When I spoke with Randall Koch (owner, head instructor) he invited me to watch a class and learn more about the program. From the moment I walked into the studio I was welcomed by Randall, JJ, and the other students. As I watched the class I realized that the students were helping each other learn the technique being taught. It appeared that each student was not only invested in their own success but also the success of their training partner. The culture that Randall has created is very special and I wanted to be a part of it. Randall and JJ are both excellent teachers. They are able to watch you perform a technique as if in slow motion and tell you what you need to do to tweak the movement so it is effective. They have also been able to help me modify techniques so my limitations don’t limit my success. Eleven months later, thanks to Randall, JJ and all my workout partners, especially Mike and Ana, I passed my Yellow Belt Test 9/29/18 and am working toward my Orange Belt. I would high recommend Krav Maga Worldwide to anyone looking to workout hard and learn a valuable skill, safely. I joined Krav Maga World Wide a little over three years ago and my life has changed so much for the better. I was extremely out of shape, overweight, and had blood test numbers so out of line the Doctor’s wanted to put me on several different maintenance drugs. I was traveling down the wrong path and needed to make serious changes. I needed to find an activity and program I would enjoy. I always wanted to learn Martial Arts and Fighting. 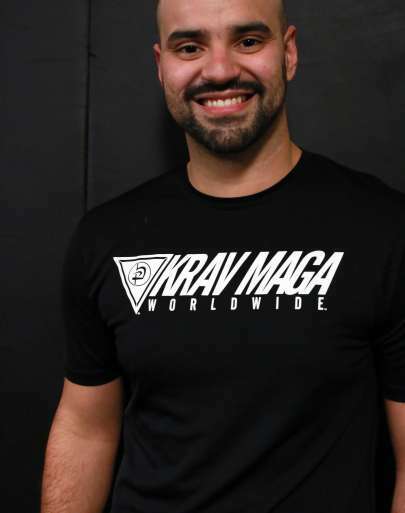 While searching online I discovered Krav Maga Worldwide in Pompano and wanted to check it out. I was invited to watch a class and learn more. At that point, I made a major decision to take care of myself and made my health a priority. I set both short and long term goals to keep me on track. My first short term goal was “Go to class, be there!” I made sure I put my Krav/workout clothes in the car the night before each class. No excuses not to go to Fitness class. That first short term goal was the building block for me to develop more short term goals, keeping me on track to reach my long term goals. 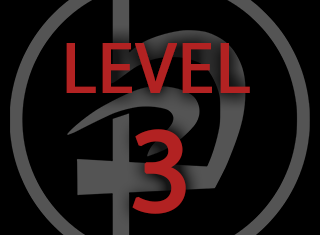 I found the Fitness and Krav Maga classes amazing, fun, and addictive! I trained, and still train, with very supportive Instructors and classmates genuinely interested in my success and keep me motivated to constantly improve. Shortly after signing up, I noticed a change starting. My eating habits improved, the scale started to move in the right direction, the cardio was improving, and I was feeling better!! Joining Krav Maga World Wide for the Fitness and Krav Maga Classes was the best decision I have ever made for myself!! Three years later I believe I am in the best shape of my life, turning “50” into the new “30”, losing over 50 lbs., and perfect blood test number results. This journey continues with continuous goal setting. Also, I still make sure my workout clothes are packed in the car the night before class! If you are looking to join a great fitness/training program, a program designed to get you in the best shape of your life through diet and exercise, and the support of Instructors and classmates to help you stick with it…YOU found it here at KMW!! Krav Maga Pompano is simply the best martial arts/self defense facility in the tri-county area. Randall Koch and JJ Oddone are the most professional, knowledgable and likeable teachers/trainers/fighters I have ever worked with. I am elated to train here and proud of all my advancements as a result of such training. Black Belt, Certified Instructor (Expert V), and Licensee since 2001 through Krav Maga Worldwide™. Martial Arts – Black Belt in 3 different styles, full time Instructor since 1994, training experience since 1982. Certified Trainer (Yellow and Orange Belt) and Level 4 Student through Krav Maga Worldwide™.